Opinions on the Alpha Burner? Frit-Happens ! > Technical Forum > Studio/workspace/setup/equipment > Torches > Opinions on the Alpha Burner? I'm thinking it's time to move on from my HH to dual fuel. I was sort of assuming I'd get a Minor, as that's what I was taught on. But looking at what's on offer, I really like the look of the Bethlehem Alpha Burner. They look so nicely engineered, and have some great reviews on American websites. They say they are good for Boro as well as soft glass which I'd like to try - haven't done that yet. Tuffnells are doing them - and I see I could buy one direct from the USA quite a lot cheaper. Does anyone have experience of these torches to share? I suppose I'm looking for something versatile, that will do big, small, soft and boro, to run off propane and (initially) one oxycon. I don't want much, do I? Re: Opinions on the Alpha Burner? Oh dearie me. Not as impressive as I imagined, then. Thanks for that, I could have made a bad mistake there. I must look for other reviews before I part with my cash! I think the cricket gets good reviews? I am melting boro on a lynx with a 10lpm oxy and that's fairly easy going! I don't think it's a bad torch, but as with all torches, it just depends on the type of beads you want to make as to what suits you best. I bet some people will love it. The Lynx sounds great, but more than I want to pay at my present level of ability. I've been reading reviews all evening, my eyes are spinning! I don't have the experience to know what I want to do; there's so much I haven't tried yet. Where do you live Moira? 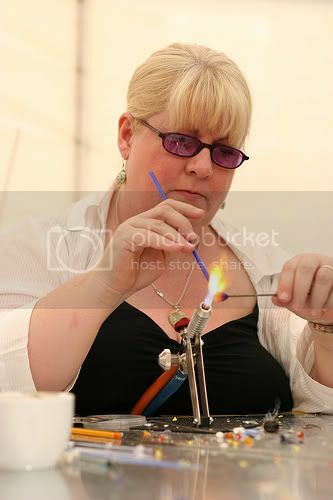 There might be some lampworkers near you who would let you go and have a play on their torches? The amount of power you have available is also partly down to the amount of oxygen you have - a Minor on loads of oxy feels decidedly different from one on a single, aging oxycon. So if you're getting the standard single 5lpm oxycon, you probably won't be able to get the best from whichever torch you do get. (You will be able to do boro, but it'll be slow and you won't get the best out of some colours). So it kinda depends on when you want to be able to do all those things, and what you want your upgrade path to be! Just don't get a big torch now and expect it to perform well on one oxycon. Crickets are better on low oxy - I preferred Minors anyway. Dunno about the Alphas.